Does your recitation in prayer meet the minimum essential standards? Before this Ramadan, find out from a seasoned Qur’an teacher in a personalized session. Four sisters maximum per session. Does your recitation in pray meet the minimum standards according to Islamic Law? Here is your opportunity to find out! This is essential knowledge. 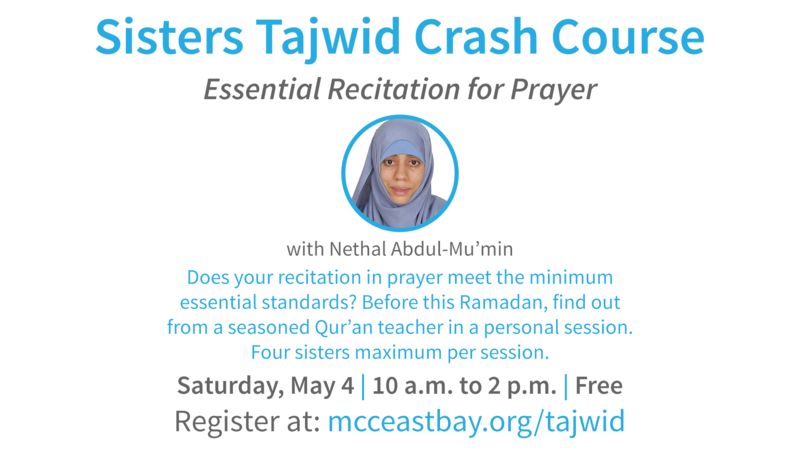 This crash course is for sisters in every step of knowledge: sisters who do not read Arabic; sisters who read Arabic but who are Tajwid beginners; and sisters who read Arabic and have a background in Tajwid. Ustadha Nethal will cover the Islamic rulings in the Hanafi, Shafii, and Maliki schools on the essential recitations of salah (prayer). She will instruct on how to read components correctly with individual assessment and instruction for correct pronunciation. Sister Nethal Abdul-Mu’min is a scholar and translator of the Qu’ran and a translator for Arabic speakers in the women’s/family health setting and during labor and birth. She is also a Birth and Postpartum Doula and Childbirth Educator who is a Homebirth mother of four.